Thanks to Jerad M. Gardner, M.D. and Ruan T. Ramjit, M.D., Emory University, Georgia (USA), for contributing this case. To contribute a Case of the Week, follow the guidelines on our Case of the Week page. (1) Don't forget to do your Holiday shopping by clicking on the Amazon.com links on our Home Page, by clicking here or by clicking on any link on our Books pages. (2) The Stains and CD Markers chapters have been changed so each now appears on one page, instead of being divided into separate pages. We are also updating these topics more frequently. (3) Our Mystery case is back! Each month, we will post an interesting image on the right side of the Home page. Click on the picture to enlarge it. Click on the link below the image for the answer, and a link to the topic for more information. A 73 year old man had a 4 month history of progressive right leg swelling with tender nodules, which began with a splinter injury while chopping firewood. Past medical history is remarkable for treated non-Hodgkin�s lymphoma, diagnosed 2 years previously. The nodules were biopsied. The organism was cultured on blood, chocolate, and Sabouraud�s dextrose agar. 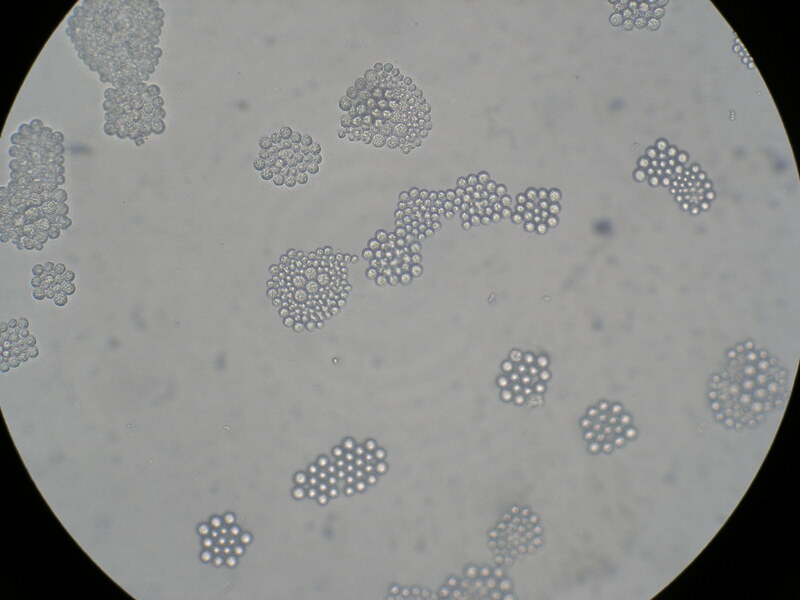 After two days, the organism appeared as yeast-like colonies on all media. Microscopic examination of the culture plates showed multiple spherical organisms in clusters with thick walls. The organism cultured on the agar plates was inoculated onto an API 20 C AUX strip (bioMerieux Inc., Durham, NC, USA), used to identify the most frequently encountered yeasts. Based on the results of the carbohydrate assimilation tests on this panel, the organism was identified as Prototheca wickerhamii. Prototheca was first recognized as a human pathogen in 1964 (J Clin Microbiol 2004;42:4907). Two species are associated with human disease - P. wickerhamii and P. zopfii. These fungi-like organisms are actually aerobic, achlorophyllous, algae-like, unicellular organisms commonly present in water, sewage and soil. Human infection is rare, and usually occurs via trauma or contaminated water, and involves the face or exposed extremities. Patients are often immunocompromised (Arch Pathol Lab Med 2011;135:941, Am J Surg Pathol 1994;18:1261). Patients present with erythematous plaques, nodules or superficial ulcers. 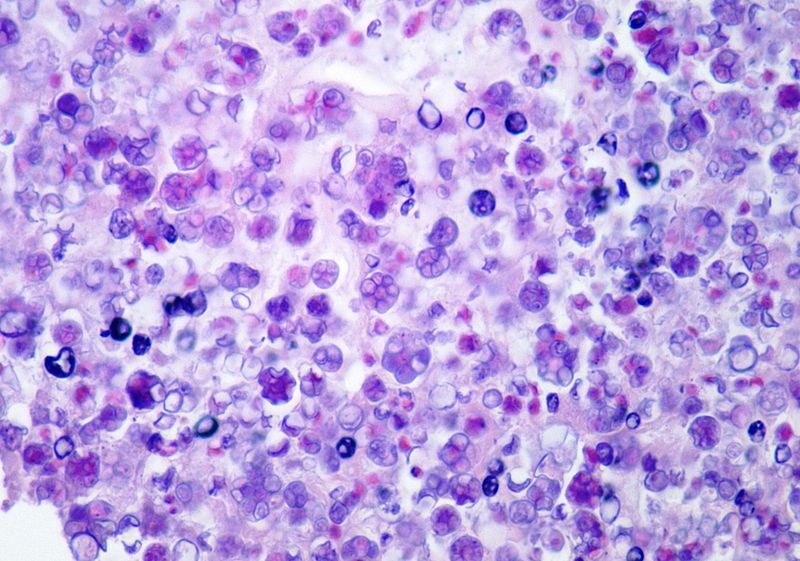 Histologically, there are necrotizing granulomas containing spherical organisms with central basophilia, internal septation and double layered cell walls. There may also be multiple endospores 2-4 microns in size. 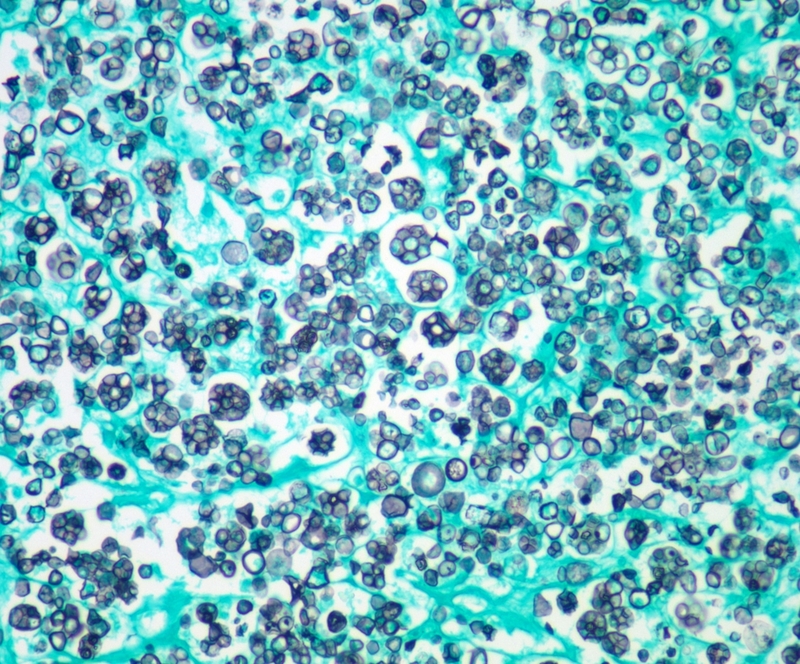 Green algae may appear similar, but contain abundant cytoplasmic starch granules (Arch Pathol Lab Med 1978;102:353). Recommended treatment is surgery or Amphotericin B for disseminated disease. 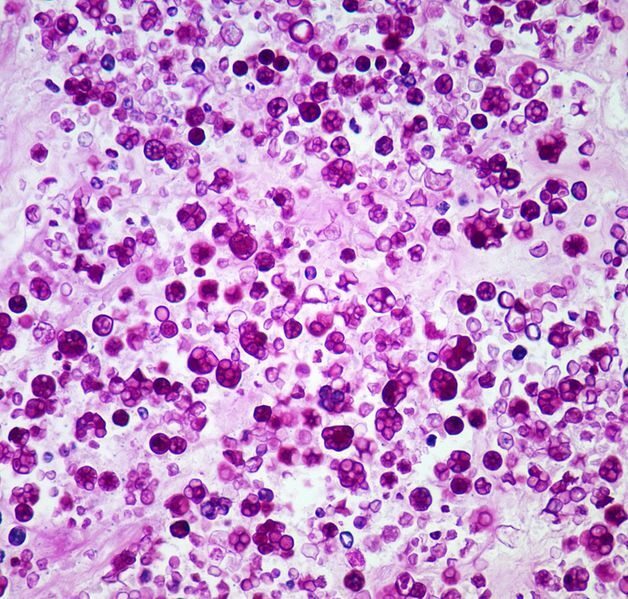 In this case, the patient had rapid progression of his disease in a lymphangiitic pattern. He was admitted to the hospital with a plan to either debride or amputate the leg, but died before surgery began. No autopsy was performed.